Any LAWYER who during the course of the year(s) will not engage in the practice of law* in Ontario. Any LAWYER on a temporary leave of absence from the practice of law, provided that the temporary leave of absence is not more than 5 years if taken for reasons of family or illness, or not more than 2 years if taken for other reasons; this exemption shall not be available to a LAWYER who has taken alternative employment. Any LAWYER employed as a law teacher during the course of the year(s), and who will not engage in the practice of law in Ontario other than teaching. • demonstrates proof of coverage for such practice of law under a professional liability insurance policy issued by a licensed insurer in Canada, such coverage to be at least equivalent to that required under the SOCIETY’s insurance plan. Any LAWYER who during the course of the year(s) will be resident*** in a reciprocating jurisdiction and demonstrates proof of coverage for the LAWYER’S practice of law in Ontario under the mandatory professional liability insurance program of the reciprocating jurisdiction, such coverage to be reasonably comparable in coverage and limits to professional liability insurance that is required under the SOCIETY’s insurance plan. (iii) which would exempt the LAWYER from its mandatory professional liability insurance program if the LAWYER were resident in Ontario and demonstrated proof of coverage for the LAWYER’S practice of law in the jurisdiction under the SOCIETY’s insurance plan which was reasonably comparable in coverage and limits to the professional liability insurance that would otherwise be required of the LAWYER by the jurisdiction. Canadian jurisdiction other than Quebec, are eligible for exemption under this eligibility rule (g), provided the above criteria are met. and will not engage in the practice of law in Ontario other than as provided for herein or under eligibility rule (d), (e) or (f) for which the LAWYER would otherwise qualify. Note: LAWYERS acting in the capacity of estate trustee, trustee for inter vivos trust, or attorney for property as described in (h) above, but otherwise qualifying for exemption under eligibility rules (a), (d), (e) or (f) above, would select eligibility rule (h) if electing exemption under the program. LAWYERS named or acting only in respect of members of their own family, however, would not be included in this, so would select eligibility rule (a), (d), (e) or (f) as appropriate. For this purpose, members of the LAWYER’S own family means “related persons” as defined under section 251(2) of the Income Tax Act (Canada). 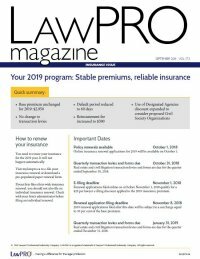 Note: Any LAWYER who would otherwise be exempt from the payment of insurance premium levies, but will provide PROFESSIONAL SERVICES to or on behalf of a non-profit organization on a pro bono basis, and wishes to remain eligible for exemption from the payment of the insurance premiums and levies during the POLICY period, should contact LAWPRO. * “Practice of law” means the giving of legal advice respecting the laws of Ontario or Canada or providing any professional services of a barrister or solicitor for others. ** “Employer” includes a single corporation as well as affiliated, controlled and subsidiary companies of the corporation or other entity employing the LAWYER. “affiliated,” “controlled,” and “subsidiary” are as defined under the Securities Act.